By	Marios Alexandrou on August 8, 2018. There is no algae that causes me more grief than black beard algae aka BBA. I've researched and read many opinions on what causes BBA, but I've yet to find a clear answer. In fact, the answers are often conflicting citing variables like flow, nutrients, lights, CO2 i.e. basically everything common to a planted tank setup. BBA grows in high and low flow areas. 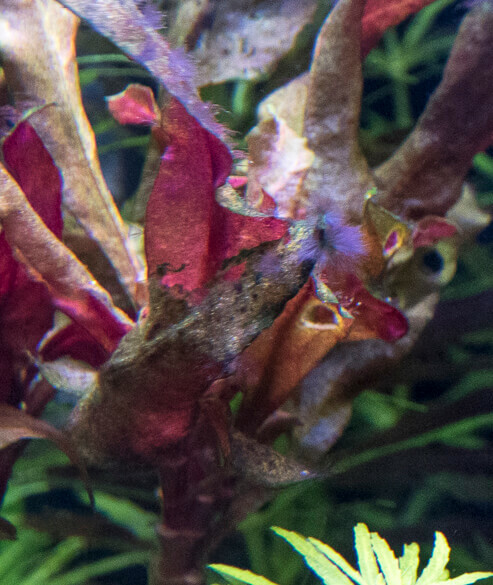 BBA primarily grows on my driftwood, but it also shows up on the top of the leaves of vallisneria and on slow-growing plants. BBA isn't affected much by light intensity as I have it growing at all levels from the substrate to the surface. Otocinclus, Amano Shrimp, and Nerite Snails won't eat BBA. Daily, double-dosing of Excel doesn't keep BBA at bay. Although it does stop staghorn algae fairly well. I get BBA even though my pH and CO2 levels are kept steady via a pH controller. 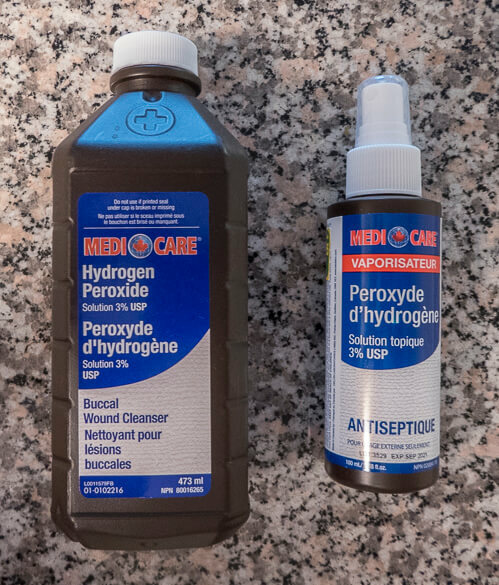 The only success I've had is with hydrogen peroxide particularly when I use it for spot treatments. I have two methods for spot treating. Regardless of the approach I use about 1 ml of hydrogen peroxide per 2 gallons of water. For areas of my aquarium that can be exposed with water changes, I will use a spray bottle to cover the BBA with hydrogen peroxide. For areas that can't be exposed, I deliver the hydrogen peroxide using a turkey baster with a thin straw attached to the end to give me more reach and precision. This has worked very well on filter components, the top of my heater, and on driftwood. I'm experimenting with this approach on plant leaves (see images to the right). So far I've managed to kill the BBA (it turns pink), but the verdict isn't in on whether I'm significantly damaging the plant leaves. I've read that people have used 2 ml per gallon with no ill effects, but I'm nervous about going that high. I've also read about a “one-two punch” that combines hydrogen peroxide and Seachem Excel in a whole tank treatment, but my situation isn't bad enough to warrant taking that kind of risk. Someone reported success using Seachem's Phosguard, but the explanation for why it works doesn't make sense to me. Replies in the thread also show there is disagreement. Still, counter-intuitive things do sometimes work. Robert, you need to use the "1-2-punch" method. Follow this link and you'll get the full description of the method. But forts you need to find what's causing the BBA and fix it. "NOTE: Others have reported deaths of shrimp, snails, and fish - particularly known sensitive ones. Please read the entire thread for details before experimenting. For anyone who wishes to try this, I am changing my initial recommendation for H2O2 to 2 tbsp. per 10G, down from 4 tbsp. This treatment seems especially hit-and-miss with shrimp, so for them, I do not recommend this treatment AT ALL - unless you consider them expendable. This is a technique I've developed. While I've provided this info in several threads now as personalized help, I feel it deserves a full write-up in its own thread. In brief: It uses a properly executed H2O2 whole tank treatment, followed by a whole tank Excel treatment, to provide a much greater algicidal effect than either alone; without noticeably increased risk to fauna or plants. This has been performed by me many times, and by others only a few. While in all cases no adverse effects were observed, I cannot guarantee it to be 100% safe. Only through many more tests in a wide variety of tanks can that be established. Keep that in mind should you decide to try it, and if you do, please share your results in this thread. Even if you don't try this, you may still find some of it informative. Whole tank H2O2 treatments don't get much attention. The results are typically very poor, at least until you get into such doses that fauna are at risk; and after a few failed attempts, most folks understandably write this option off. But the truth is, most people perform this treatment completely wrong. Typically, the first thing done is to turn off the filters and lights. Already, one mistake has potentially been made, and a path paved to another. Turning off the filters does prevent H2O2 from flowing through the biomedia. That's good, because we don't want the H2O2 to kill too much nitrifying bacteria, nor want the H2O2 depleted at this point in reaction with these bacteria. But often, this leaves little or no flow in the tank. The effect of any chemical is determined by: Concentration * Flow * Time. A H2O2 spot treatment works with no flow, solely because of the incredibly high concentration at the location where it's applied. But in a whole tank treatment, it's far more dilute. So instead, high flow is required to carry it around the tank, to contact the algae and have some positive effect. Without that, there is only one place where high flow is occurring. Fish gills. And that is the one thing we don't want the H2O2 reacting with! Moving on now. The H2O2 is added. Some amount of time is allowed to elapse, a half hour or so. Then the treatment is "terminated", by turning filters and lights back on. This is the next mistake. Virtually all of the H2O2 still exists in the tank, because without flow, very little of it has reacted with anything. While light does break down H2O2, this is measured in days - even in direct sunlight. Not minutes. So the light has no effect, in the time scales we're working with. The biofilter at least is now reducing the H2O2. And with flow restored, the H2O2 is at last starting to have some effect on the algae. But the fish are already getting close to suffering noticeable stress. The full concentration of H2O2 has been flowing through their gills for a half hour, completely without reason since this time did nothing to kill the algae. And they will continue to be exposed to gradually lessening concentrations, further increasing the stress, as the filter slowly removes it. It may take another half hour before H2O2 is sufficiently reduced. As I said before, Concentration * Flow * Time. So if you want an effective treatment, provide massive flow during the entire treatment period. Since flow is constant through fish gills, to protect them you shorten the time, by wasting none of it with periods where the algae isn't affected, and correctly terminating the treatment. If this is done, the increase in safety is actually enough that concentration can be increased. First, prepare the tank. You want as much flow as possible. If you have extra powerheads, add them. If your sole source of flow is your filters, you'll have to temporarily remove the filter media to a bucket of tank water, and leave the filters on. Otherwise, this is optional but still beneficial. I have a cheap Koralia clone that with 1,320GPH flow, turned out to be too much for any of my tanks; but I keep it around because it's ideal for this treatment. If you have Marimo balls, temporarily remove them to a bucket of tank water as well. Cladophora is very hardy, and normally not affected by whole tank H2O2 treatments. But this treatment can burn them badly, especially on sides exposed to direct flow. If they're also infested with undesirable algae, they can be treated simply by keeping them in the bucket in a dark place for a week. They can tolerate extremely long blackouts without harm, unlike other algae. Keep the lights on. Light has no effect on the H2O2, only your ability to see what's going on. Now add 3% H2O2, at a dosage of 4 tbsp. per 10G of actual tank water volume (excluding substrate, plants, etc). Yes, that's double what's typically used; as explained previously we can use a higher concentration. Allow to circulate for 15 minutes. During this time, redirect flow a few times if possible, to make sure all areas get covered. If you have particular trouble spots, try to ensure they get direct flow during part of the treatment. Now terminate the treatment. Do a 50% water change, or more if you know it's well tolerated. Return the tank to its normal configuration, including replacing filter media if it was removed. Any remaining algae not killed by the H2O2 is now extremely susceptible to Excel. If you weren't already using Excel, or were using it at the recommended dose, add Seachem's recommended initial dose of 5ml per 10G. No further large doses are necessary in this case. Algae builds up some tolerance to Excel, similar to sensitive plants like Vals. In this case, the H2O2 treatment followed by a single, sudden Excel spike is enough to quickly finish algae off. If you were already using Excel overdoses, continue using the previous dose. Enjoy your algae-free tank. If there are any underlying problems that caused the algae outbreak in the first place, correct them so your tank stays algae-free. In some cases, a thorough algae removal like this is enough to improve plant health to the point where algae will not return. I've used this treatment many times over the course of the last year. It was originally developed to deal with what I call my SOS, "Staghorn On Steroids", as featured in my signature. SOS doesn't behave quite according to the rules. Like most algae it likes high light, but will thrive in medium light if flow is high. It laughs at high CO2, H2O2 spot treatments, and Excel spot/tank treatments. But it falls hard to the "One-Two Punch", and I relied on this treatment heavily when trying to figure out how to keep it from growing. Which took a while, during which time I probably would have given up in frustration if I hadn't found a way to periodically eliminate it, without ripping out half my plants after each failed tank parameter adjustment. I've tried it on other algae too, mostly out of curiosity rather than necessity. Works great. Burning my Marimo balls was a nasty surprise, but certainly showed how effective it is, as they've never been affected by any other algicidal treatment. Should I ever have an invasive clado problem, I expect this might be able to eliminate it. I've never seen any adverse effect on the more sensitive inhabitants of my tank; including otos, cories, bamboo shrimp, ramshorn and pond snails. No idea if it's safe for other shrimp, as I keep no other varieties. I'd like to see someone try it on a tank with a few expendable cherries. 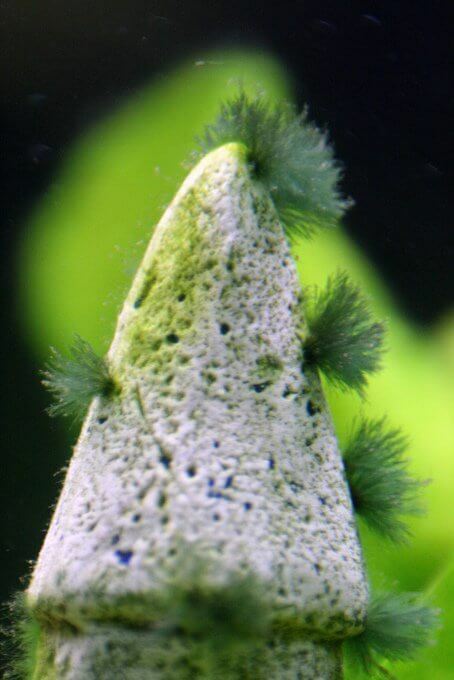 Java moss was unaffected. I have some anacharis, which is particularly sensitive to Excel, but which I've gradually acclimated to a normal dose; it too is unharmed by this treatment. Hopefully others can soon add their experiences. Off-topic but related. Recently I see the use of AlgaeFix being more freely discussed, now that certain people have finally softened their views on it, and mentioning it no longer results in guaranteed chastisement. Yes, it works, I've used it, and it's certainly easier than my method. But it isn't safe for invertebrates. Several times I've also had fish severely stressed or killed by AlgaeFix, and although in the majority of cases this doesn't happen, I consider it a gamble. I have an idea why this occurs different from other hypothesis I've seen, and how it might be avoided, but that's a topic for another thread I'll soon post. At this time I consider my treatment possibly safer than AlgaeFix when a powerful full tank treatment is required, and certainly usable in more circumstances. Hope this proves useful to you!" I tried this “1-2-punch” this morning. Below is what I did. I will post the results in a week or two. Background: 65g, I would say a medium plant density (mostly swords and Brazilian pennywort) Finnex planted+ 24/7, Fluval 306 canister filter and a small circulation fan. I had some BBA a few months back, so I used that as an excuse get pressurized CO2. My thinking was that giving the plants CO2 along with my current lighting and fert dosage would give the plants the advantage to out compete the BBA for nutrients. I cleaned up what BBA I could by trimming a few plants and taking out and bleaching the rocks and filter intake and outflow pieces. There were a few small spots I missed, but decided to leave there as a “controll group”. I wanted to see if it grew or spread after adding the CO2. After about 2 weeks of CO2, none of the spots of BBA had grown and the plants looked great with a lot of new growth. Last night I noticed that three reddish swords (maybe red Rubin?) had some laves almost completely covered in BBA. I don’t think I noticed it before as the BBA didn’t stand out as much on the dark leaves as is does on lighter plants and hardscape. I decided I needed to look into the peroxide method and found this thread. My method: I decided I have about 50g of water in my 65g tank. This may be a bit conservative, but was a best guess and a round number. I added 10 Tbsp (2 per 10g @ 50g) of 3% peroxide to a glass, then added another 10 Tbsp of tank water, giving me a 50/50 mix of peroxide/water. I then used a syringe to spot treat the worst areas with the mix. Once done, I poured the remaining mix into the tank. It was about 5 minutes from the time I began spot treating to the time I poured the remainder in the tank. I then took my circulation fan off the glass and blew it all over the tank for another five minutes to make sure there was good circulation. I left my canister filter on the whole time. After another 5 minutes (15 after beginning the spot treatment and 10 at “full strength” I began the water change. By the time I got about 30g out of the tank, it had been 30 minutes of “full strength” peroxide (2Tbsp per 10g of water). I then began to add back prime treated fresh water. I had the tank back to capacity at about 45 minutes. So overall, I had about 30 minutes of “soak time” at full strength before I began diluting with the fresh water. I then added 30ml of Excel, 10ml at a time in spot treatment fashion, with the syringe. There were a few leaves I intentionally did not spot treat with either the peroxide or excel. I wanted to see how these areas reacted with just the general treatment. A no time did my fish seem stressed (mostly tetras and a few platys), but I did add the recommended dose of Stress Guard, just in case. I also replaced the liquid in my drop checker. I don’t know if this was needed, but I did it just in case. Since I didn’t shut off my filter, I am going to test my ammonia, nitrites and nitrates every day for a week or so to see if this process killed enough bacteria to start a new cycle. I plan on adding more plants as I think with the added CO2 and increased ferts, there were not enough plants to pull enough nutrients out of the water, giving the BBA th extra nutrients. 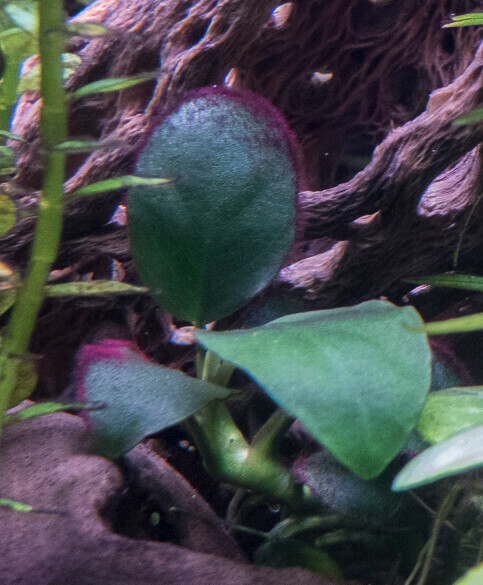 Plus, since most of my plants are swords, I think a lot of the ferts in the water column were going unused. Until then, I plan on scaling back the CO2 and ferts. Thanks for the info! I’ll let you know the results soon. Flying Foxes eat BBA. I've seen mine do it, ripped it off and ate it like it was cotton candy. He outgrew my tank and I took him to the fish store and now that he's gone, the BBA is growing on my driftwood again. Still trying to decide if I should get another little one or treat the driftwood with a Hydrogen Peroxide dip. I've heard about a few species of fish that eat BBA, but it seems different people have different experiences. I'm glad they worked for you. I've tried everything in the book to get ride of BBA from my tank but nothing works. They say Siamese Algae eaters love the stuff. Not any that I bought. Hydrogen Peroxide, nothing, Excel a wast of money. etc. I'm using Phosguard by Seachem now for the past 2 weeks. BBA is till growing but maybe a little slower. I do a 50% water change weekly. I feel like a slave to my planted aquarium. The enjoyment of this hobby is gone. I hate even looking at it anymore. I have been struggling with this nightmare for almost 2 years now. I've had some recent success with Excel. I turn off filtration and let the water settle. Then I use a syringe to squirt Excel onto the BBA under the water. I squirt it very, very slowly. I use no more than double the dose that I would normally put into the water as a whole. In a day or two the BBA turns red. Because the amount is small, I need to dose multiple times to hit all of the areas in the tank that have BBA. Thanks for your reply. I have doing what you suggested for over a year with out results. Every week when I do a water change and the water level is low I spray everything. I then wait 15 to 20 minutes before adding water back to the tank. It helps a little but it grows back in a week or so. Like I send in my original post that I tried everything. And I mean everything that I've read on all forums and others. Thanks again for your time to reply.